Featuring soft rubber in-slot inserts, smart charging control and automatic power cut-off, the Gelid Fourza makes it easy to dock and charge multiple phones and tablets. 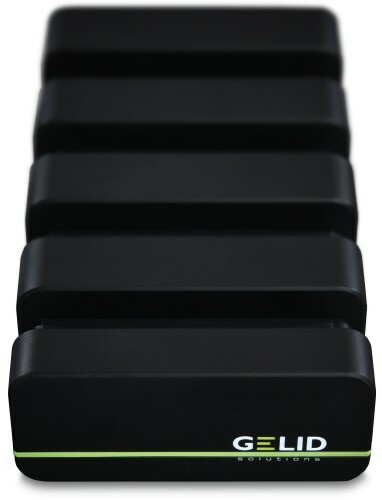 Fourza provides a contemporary designed docking surface which supports four mobile devices of different kinds and sizes. Specifically tested Apple smartphone and tablet devices, varying different Android mobile phones and tablets all wearing standard protective cases or bumpers to fit well in the designated device slots. Fourza features the soft rubber insert in each slot which protects the mobile from bumps and scratches. It also secures your smartphones and tablets to prevent slippage. You can dock and charge your mobiles equipped with a standard protective case type, military grade rugged case or extended battery case up to a maximum thickness of 15mm. Fourza provides 48W total power output and can charge up to four smartphone or tablet devices simultaneously, such as Apple iPhones or iPad Mini. The Smart IC, a core part of Fourza Charger Unit, automatically detects proper current for your mobiles and manages efficient charging cycles to ensure safe charging and to extend battery life. It also supports power cut-off for compatible devices.